Ad blockers are certainly a problem for advertisers and publishers, but in the United States the usage is not as bad as it could be. Based on data from PageFair, the U.S. ranks in the lower half compared to Europe in terms of current desktop ad blocking penetration (18 percent), yet four out of 10 U.S. firms are seeing their website traffic shrink according to Adobe. 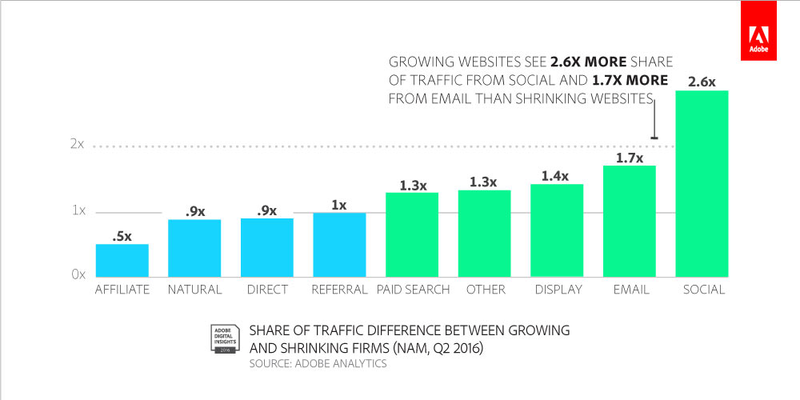 Growing websites, however, are focusing on two channels to get around the decline in display traffic. Adobe reports that as ad blocking penetration increases, traffic from display tends to decrease, but the decrease in display traffic is offset by an increase in traffic from social media (it doesn't separate paid social from organic social). Growing websites (traffic increased between Q2 2013 and Q2 2016) are placing more emphasis on social and email channels with social's traffic share accounting for more than two times the smartphone traffic for growing firms and email representing 1.7 times more smartphone traffic than that of shrinking firms (who saw declining traffic from Q2 2013 to Q2 2016). Adobe also indicates that "declining firms" relied on affiliate/partners and natural search for their traffic acquisition needs.